To better understand Alma 22:32, Alma 63:5 and Ether 10:20 we looked at all textual occurrences of the words "narrow," "strait" and "small" in the Book of Mormon to get a sense of the Nephite meaning of those terms. We concluded any geographic feature exceeding 20 kilometers in width is completely out of the question - the Nephites would not have called it narrow or small, with 5 kilometers a much more likely upper limit. See the blog article "Narrow and Small Things." The language that fell from the Prophet Joseph's lips in the moment of translation was Early Modern English as we saw in the blog article "Early Modern English." This makes it important for us to understand the sense of meaning the word "narrow" carried in the A.D. 1470 - A.D. 1700 Early Modern English era. We will examine the Oxford English Dictionary to see how the term "narrow" was used in geographic contexts in Early Modern English. The word "narrow" appears over 4,000 times in the OED, so we have abundant data to work with. The general sense of meaning for narrow is something slender or constricted, whose breadth or width is small in proportion to its length. An urban street with houses on either side is narrow. A tree-lined country lane is narrow. A brook or rivulet is narrow. The strip of earth between furrows in a plowed field is narrow. Shakespeare bundled narrow lands in allusion with urban alleys and woodland creeks. "One that countermands The passages of allies, creekes, and narrow lands." William Shakespeare, Comedy of Errors, 1616. "Hee did shut them [Irish rebels] up within those narrow corners and glynnes [glens] under the mountaines foote." Edmund Spenser, A Veue of the Present State of Ireland, 1596. Reading Spenser in context it is clear the mountains he refers to are Mourne Mountains rising to elevations in excess of 600 meters in Newry and Mourne Council, Northern Ireland. 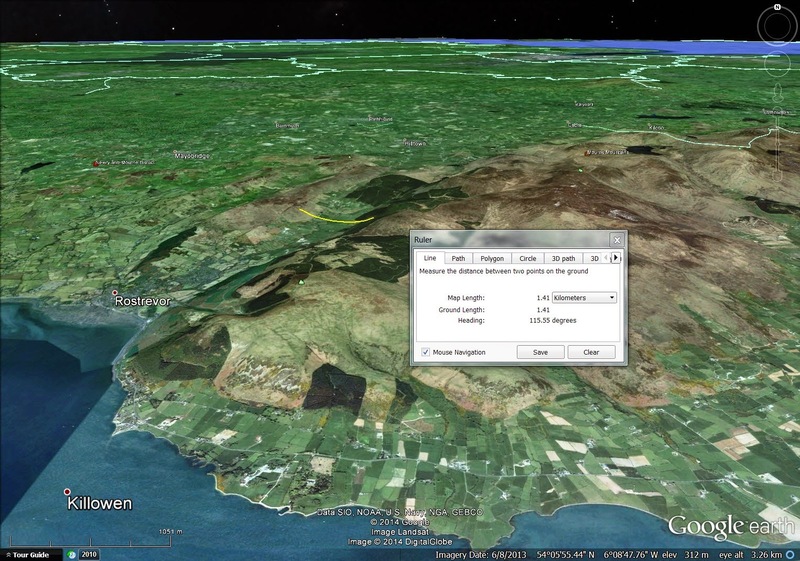 This is a Google Earth image of one of the narrow glens at the foot of Mourne Mountains. This glen is 1.41 kilometers wide at the point indicated. "The small narrow streight of Menai." William Camden (Philemon Holland, translator) Britain; or A chorographicall description of England, Scotland and Ireland (London: G. Bishop and I Norton, 1610). Menai Strait is a stretch of tidal water separating the Isle of Anglesey from the Welsh mainland. It is .77 kilometers wide near Bangor. "The haven of Messina is...compassed almost round with the city on one side, and a narrow languet or neck of land on the other." John Ray, Observations topographical, moral, and physiological..., 1673. The word "languet" derives from the Middle French word "languete" meaning "tongue." We saw in an earlier post that other Romance languages use the phrase "tongue of land" as their equivalent of the English "neck of land." See the blog article "Romance Languages." We see here that John Ray considered "tongue" and "neck" of land synonymous in English as well. 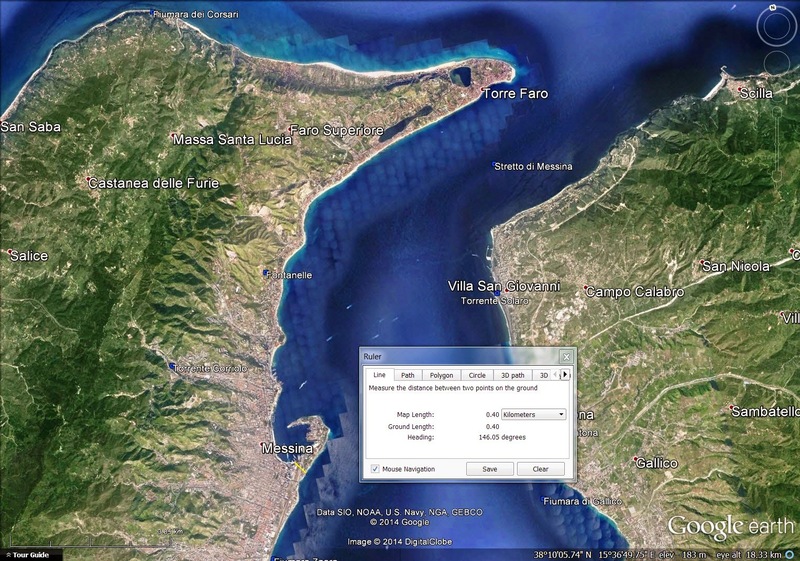 This is the Sicilian land form described as a narrow neck of land in Early Modern English. 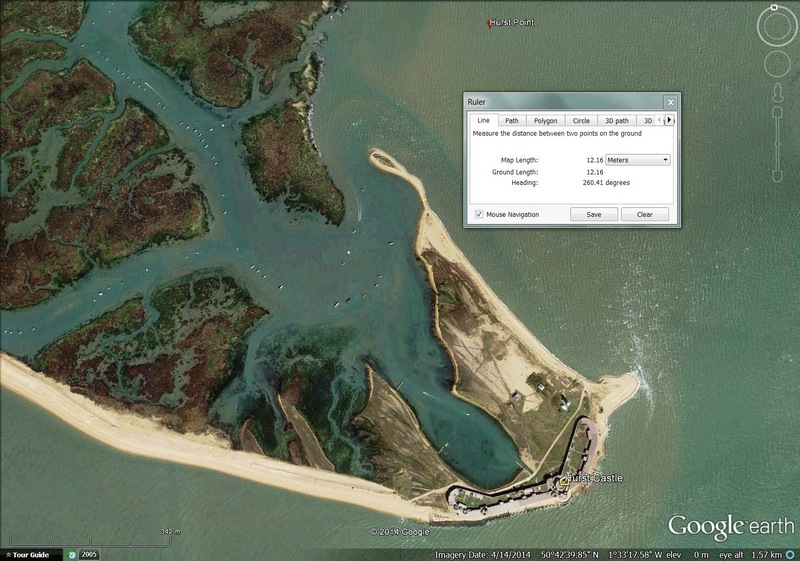 The curved peninsula is .40 kilometers wide at its base. In the Elizabethan era, Sir Francis Drake sacked the Spanish town of Cartagena on the north coast of modern Colombia. The noted English historian William Camden wrote that a narrow neck of land lay between Cartagena's harbor road and the ocean. "A narrow necke of land betweene the innermore rode [road] of the hauen [haven or harbor], & the Ocean." William Camden (Robert Norton, translator), The historie of the most renowned and victorious princesse Elizabeth, late Queene of England, 1630. 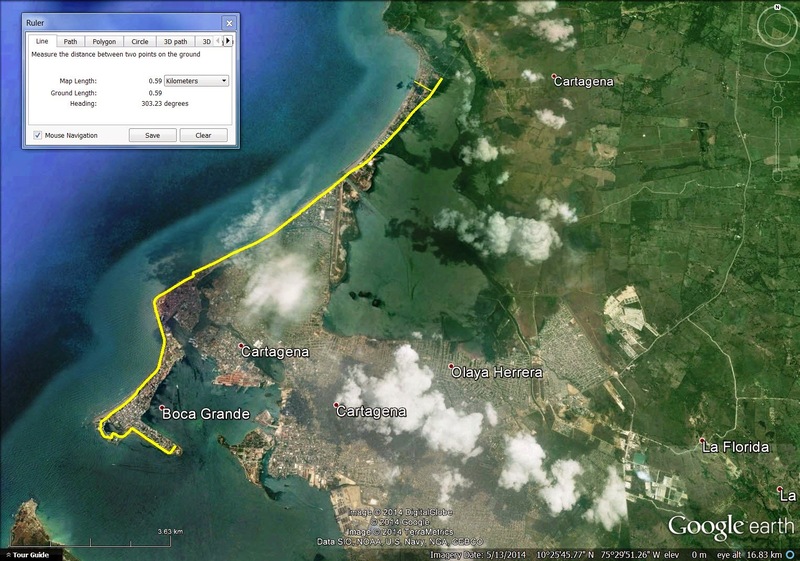 The yellow line on the map below shows the harbor road around Cartagena. The narrow neck of land is .59 kilometers wide at the point indicated. "Wawne [Walney] Iseland wch is a narrow screed of land lying before Fourness..." Henry Slingsby, The diary of Sir Henry Slingsby of Scriven Bart, 1644. 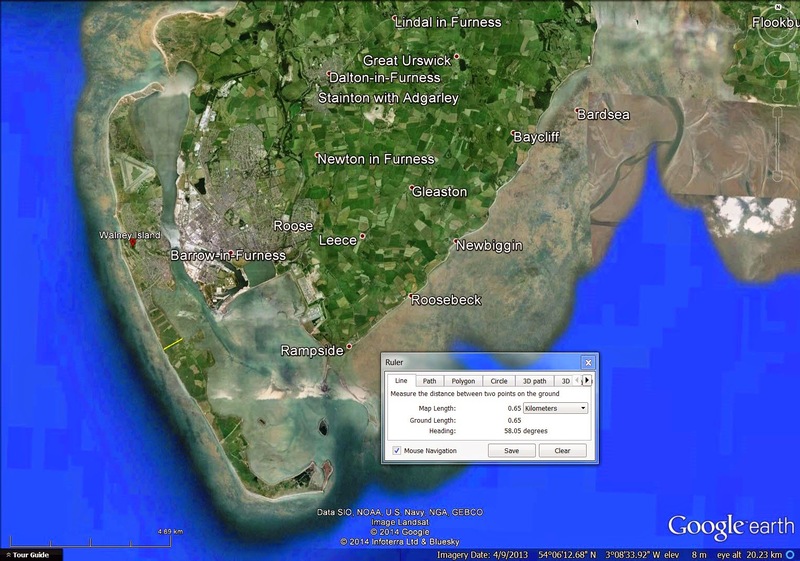 Walney Island is .65 kilometers wide at the point indicated and 1.29 kilometers wide at the triangular-shaped airport on its northern end. "Creeks of the sea is an inlet cornered into the main land, shooting with a narrow passage into some angle of the land...and this appears on that great arm of the sea on Humber, where it runs betwixt Lincolnshire and Yorkshire." Robert Callis, The Reading of the Famous and Learned Robert Callis, Esq.upon the statute of sewers, 1642. 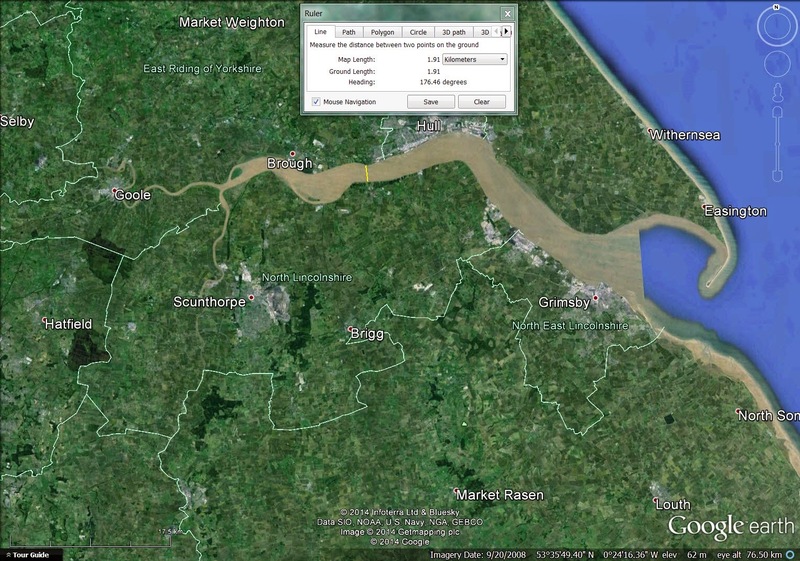 The tidal inlet Callis refers to goes by the name "River Humber" today. River Humber is 1.91 kilometers wide at Humber Bridge. "The pass is narrow...Between those Hills." Tiberius Catius Silius Italicus (Thomas Ross, translator) The second Punick War between Hannibal and the Romanes, 1661. The narrow pass referred to here is the section of the Appian Way between Forchia on the west and Arpaia on the east in the province of Benevento, Italy. 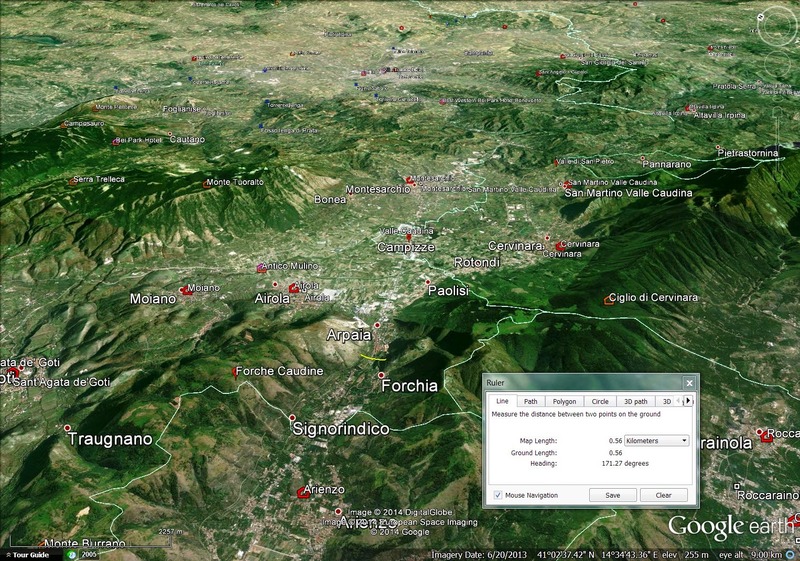 This pass is .56 kilometers wide at the point indicated. "Beyonde the which I find a narrow going or stricktland leading from the poynte to Hirst [Hurst] Castle." William Harrison, Historicall Description of the Island of Britain, 1577. The word "strict" here has the sense of "narrow." The narrow land leading from the point to the castle is only 12 meters wide at its neck. "Through which narrow streights, Alexander...made his armie to pass." Nicolas de Nicolay (Thomas Washington, translator) The navigations, peregrinations and voyages, made into Turkie by Nicholas Nicholay, 1585. 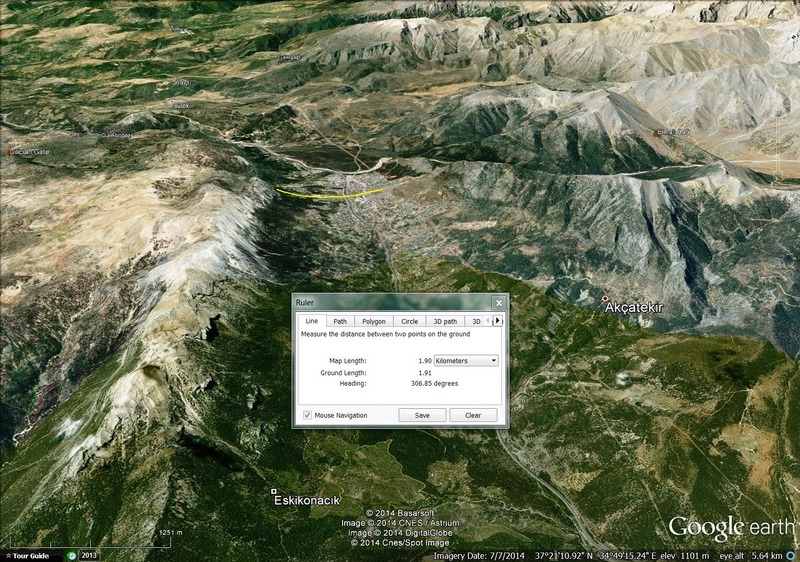 The narrow straits are the Cilician Gate, a pass through the rugged Taurus Mountains in south central Turkey. The Cilician Gate is 1.90 kilometers wide at the point indicated. "Which, by a very narrow Isthim or necke of land groweth to the rest of the Iland." William Camden (Philemon Holland, translator) Britain, 1610. 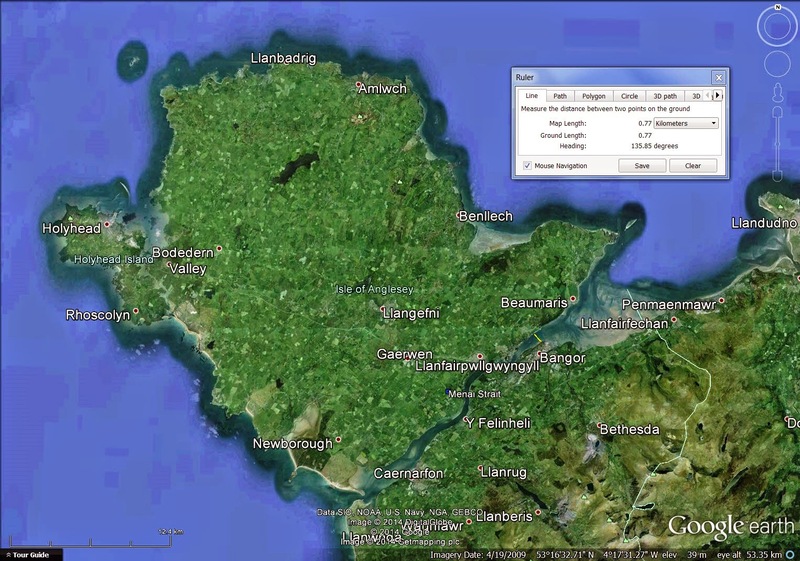 Camden is describing the Ards Peninsula in County Down, Northern Ireland. 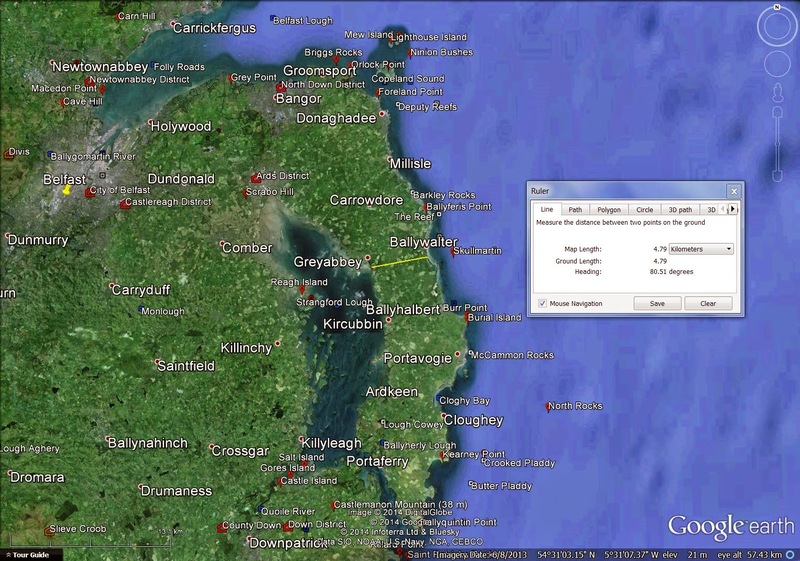 Ards Peninsula is 4.79 kilometers wide just south of Greyabbey and Ballywalter. These results corroborate our findings from the text. Many long, slender geographic features less than 5 kilometers wide were called narrow in Early Modern English. In addition, some features wider than 5 kilometers were also called narrow in the Early Modern English era. Moscow, Russia is on the Moskva, tributary to the Oka, which is tributary to the Volga which empties into the Caspian Sea. The Don, anciently considered the boundary between Europe and Asia, flows into the Sea of Azov which communicates with the Black Sea and ultimately the Mediterranean. 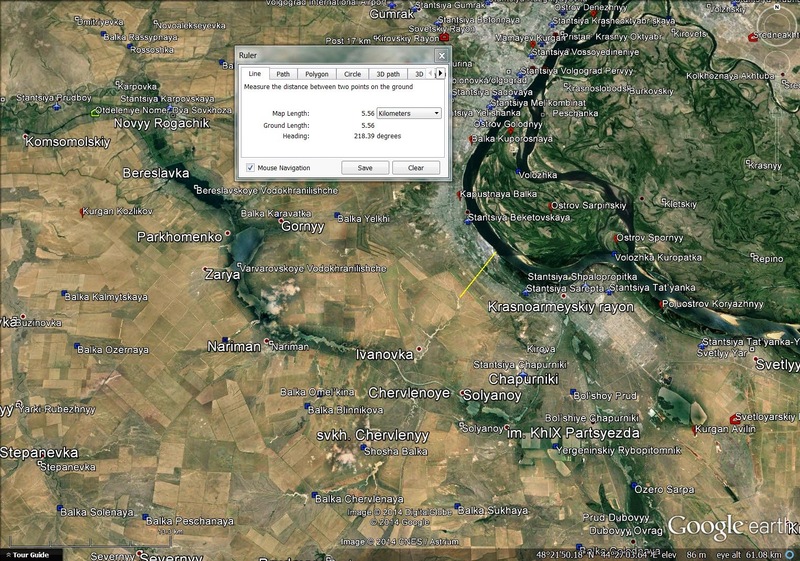 The Volga and the Don flow within 60 kilometers of each other, with tributaries much closer than that. Today, canals and locks join the two waterways. In former times, river men traveled down the Volga, hauled their boats over a portage on wagons, and continued down the Don. This is a description of the portage: "A little Isthmus or narrow slippe of lande." Giles Fletcher, Of the Russe common wealth, 1591. This portage was 5.56 kilometers long. Numerous sources in the Early Modern English era use the word "narrow" to refer to the land between the River Forth emptying into the Firth of Forth and the River Clyde emptying into the Firth of Clyde in southern Scotland. Here is one example: "Agricola began...a Wall or Vallum, upon that narrow space of Land that lies between the two Fryths." William Temple, An introduction to the History of England, 1699. 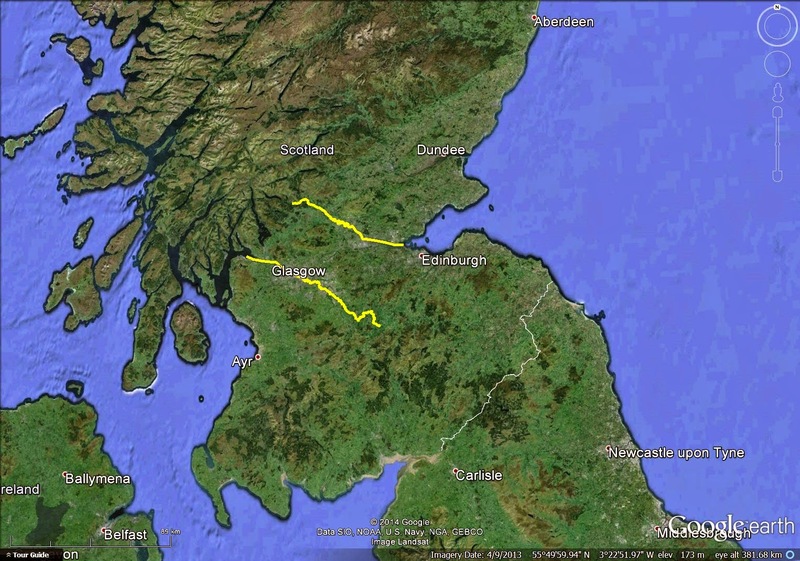 The distance from Glascow to Stirling or Hamilton to Falkirk is about 35 kilometers. The distance from the Dumbarton tidal flats to the Grangemouth tidal flats is 51.07 air kilometers. Today we call this Roman construction begun in A.D. 142 the Antonine Wall, not to be confused with the better known Hadrian's Wall further south that was begun twenty years earlier. 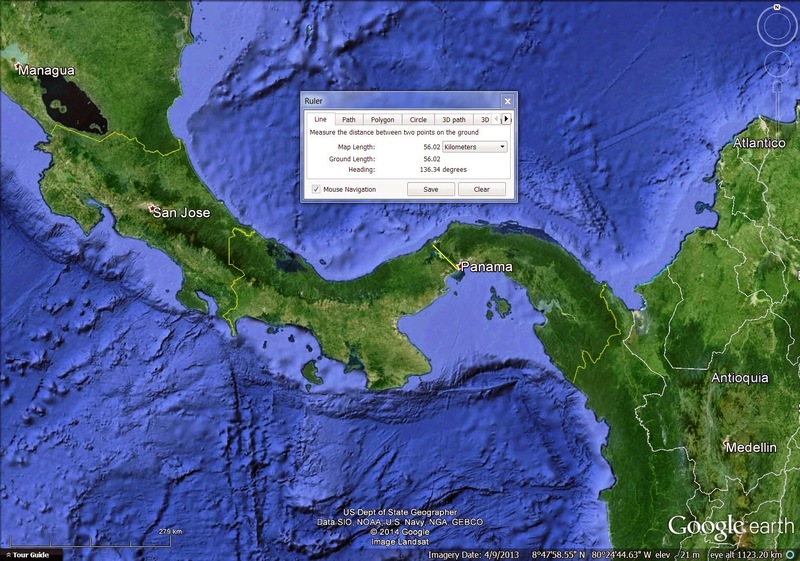 In the blog article "OED on Necks of Land" we give several examples where the Isthmus of Panama [Darien] was called narrow by Early Modern English writers. The distance from Colon on the Atlantic side to Panama City on the Pacific Side is 54 kilometers. From this brief look at Early Modern English usage of the word "narrow" in geographic contexts, we conclude that a feature wider than 100 kilometers would not have been called narrow in the 1470 - 1700 time period. Features smaller than 5 kilometers wide were routinely called narrow. Features between 5 and 56 kilometers wide were sometimes called narrow when compared with large adjacent land masses (Scotland, Russia, the Western Hemisphere). In all cases, something narrow was slender or constricted with a width much smaller than its length.